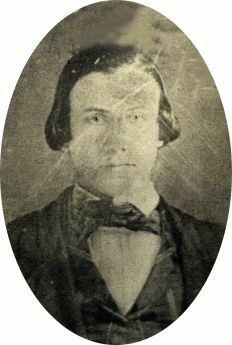 GEORGE SPENCER, a MORMON SHOOTER AND CLUBBER, was a member of the Iron County Militia; a son of Moses Roswell Spencer and Alma Flagg, was born 7 October, 1829 in West Hartford, Connecticut. The following except was taken from the online book: "Massacres of the Mountains: A History of the Indian Wars of the Far West"; By Jacob Piatt Dunn Published 1886, page 314. "It was not strange that men told in low tones how the spirits of the dead met nightly at the old camp and re-enacted the bloody tragedy. It was not strange that the lives of those who neither dared to speak while living, nor to die without speaking, became hideous nightmares. It was not strange that a lad of Beaver drank deeply of rum, without staggering, and horrified his acquaintances with recitals of the visions that he saw. It was not strange that young Spencer, the school-teacher at St. George, wasted to a skeleton, and, after writing piteously to his bishop and to Brigham Young for some assurance that could drive away the terrors that haunted him, died in grew- some tortures of remorse. It was not strange that, from time to time, as opportunity offered, Mormons escaped from the territory, apostatized, and relieved their guilt-laden souls by confession. But it was strange that the Mountain Meadows, whose verdant heath had induced its name, became barren and sterile, and to this day remains the abode of desolation. And what did the Mormons do all this time? They bent every power to show that the massacre was the deed of Indians who had been incensed by outrageous conduct of the emigrants. They slandered the victims in the most vindictive manner. They said the relatives of the surviving children refused to receive them, saying that "they were the children of thieves, outlaws, and murderers, and they would not take them, they did not want anything to do with them, and would not have them around their houses,'' and that in consequence the children were sent to "the poor-house in St. Louis ." There was not a Mormon of any prominence who did not know the truth about the massacre, and not one who did not take part in this deception. George Q. Cannon, late Representative in Congress, wrote articles to prove the Indians guilty. Brigham Young maintained it for years, and then swore that he knew the truth within three months after the crime occurred." Information on the above Mormon Shooter and Clubber, was obtained from the following: George Spencer Family, Mountain Meadows Massacre Assassins, Bagley, Dunn and Shirts.